For almost two years, protests during the national anthem before the game have been a growing PR challenge for the National Football League. 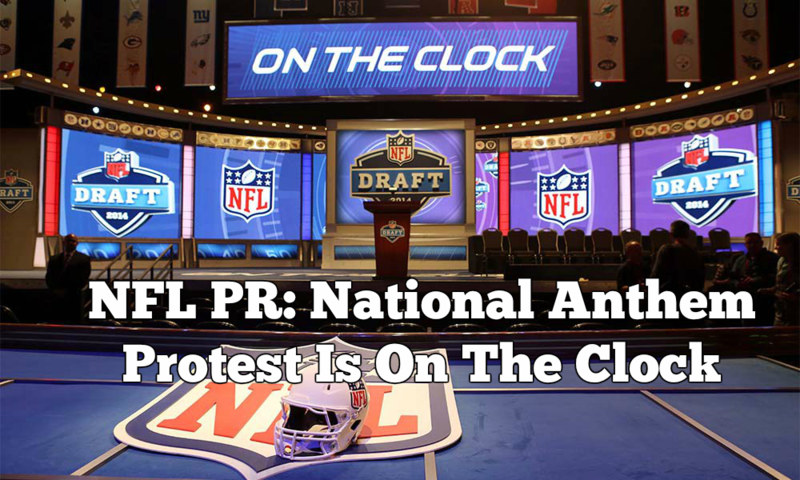 With the 2018 NFL draft beginning today in Dallas, speculation has intensified about whether the demonstrations will continue through the 2018 season and how the league will manage them. Since 2015, NFL ratings have declined 8% in 2016 and almost 10% last season. During the 2017 season, unfavorability among fans fell to 32% — note that these are fans of the sport who watched at least two games. Though many factors can contribute to such a drop, surely the relentless public controversy hasn’t helped the situation. Reputation and ratings are down, yet profits continue to rise. This poses a question for an organization that raked in about $14 billion in revenue in 2017. How much does the NFL really care about its tarnished image? Is the league too big to worry? The answer seems to be no. Clearly, the league’s reputation management has moved beyond its annual kids’ “Punt, Pass, & Kick” competition. We took a look at some of commissioner Roger Goodell’s public statements over the past couple of years in response to the protests to analyze how well its communications strategy has worked. When Colin Kaepernick first took a knee in 2016, Roger Goodell’s communication was fairly critical of the protest but sought to find a middle ground. He said, “I don’t necessarily agree with what he is doing,” while offering a morsel of empathy for the social movement. This broad message, “I support our players when they want to see change in society” came off as a bit generic. Goodell’s statement reinforced the NFL’s alignment with quintessential American values — the flag, freedom, and the military. Given that NFL fan demographics skew middle-aged male, high-income, and white, it’s not surprising that football would play it safe. But at the time of the initial statement, it was still early, and Goodell probably thought the protests would fade. The stakes rose after Kaepernick lost his job. The 2017 season began without him, but not without controversy. Players, coaches, celebrities, politicians, and fans all said their piece. Kenny Stills of the Miami Dolphins famously urged players to speak out in Kaepernick’s defense. The NFL offered more measured responses as the controversy grew. In August, Goodell said, “The national anthem is a special moment to me… But we also have to understand the other side, that people do have rights and we have to respect those.” It was an accommodation to both sides but like most such statements, it didn’t convince anyone. After that, Goodell was forced into a defensive mode, decrying the comments as divisive and warning that they “demonstrate an unfortunate lack of respect for the NFL.” The response unified the fracturing NFL for a hot second. In late 2017, the league sent a letter to NFL owners asking them to require players to stand during the anthem. Goodell wrote, “The controversy over the Anthem is a barrier to having honest conversations and making real progress on the underlying issues. We need to move past this controversy, and we want to do that together with our players.” At the ensuing press conference, the commissioner delivered the clearest messaging yet on the issue. He maintained that players should stand during the anthem. the action was decisive and – the NFL hoped – patriotic. He then spoke about trying to “deal with the underlying issue and understand what it is they are protesting.” These statements communicated greater empathy than in the past, but, more importantly, seemed to take a measure of responsibility in finding solutions to the crisis. The NFL’s position had evolved, and the organization’s next actions showed greater urgency. In January 2018, Goodell trumpeted a landmark seven-year,deal with the Players Coalition, wherein the coalition agreed to end the protests and focus on an unprecedented $89 million social justice initiative. From a corporate citizenship/community relations point of view, the initiative moves well beyond PR expediency. The NFL executives collaborated with the players on the project, helping to mollify any antagonism and sharing responsibility. In accompanying public statements, the league admitted that it failed to understand the depth of the issue for many players, a candid admission of its mistakes. The announcement remains controversial, and there’s no guarantee that some players won’t protest in the future, but it marks a major commitment as well as the first truly unifying step by the league. Unquestionably, this corporate crisis has perplexed the league’s executives, and the social justice initiative comes very late in the game. The best outcome would involve concrete results that could be showcased in a serious, non-self-congratulatory manner. The NFL PR team seems to have learned from its mistakes, guiding the organization through these tough times while maintaining its association with traditional American values. There are still many reputation land mines for the league to fight, including brain injuries among players, violence against women and other issues. But it is at last making progress in tackling the painful and divisive problem of racial justice with the right kind of constructive action.